This small eco-lodge offers complete tranquillity in an elevated location, overlooking the lagoon at La Somone in Northern Senegal, yet just a 20-minute walk to the nearest beach. "What an amazing and unique place to stay - a perfect place for wildlife lovers, not to mention the universal appeal of a stunning and inviting infinity pool. The jackal we spotted just outside the lodge was a real treat.​​"
The real sense of peace, and being close to nature yet still with a luxurious feel. The stunning views towards the coast from the lodge’s elevated location – best enjoyed from the pool. As this property is quite remote (although only a 20-30 minute journey to Saly), you'll likely eat each day in the à la carte restaurant, enjoying its extensive menu. 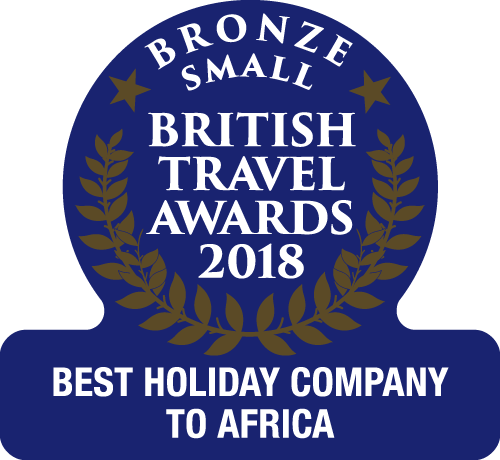 We would recommend combining a few days here with another property in either Senegal or The Gambia. 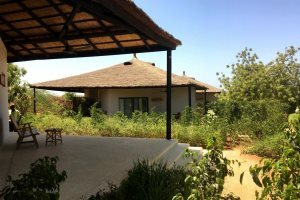 This small and friendly lodge is gaining an excellent reputation and proving popular with visitors and dignitaries from Dakar looking to escape the city for a few days' relaxation in the heart of a natural reserve. Set within nine hectares of tropical and colourful gardens which are wonderfully preserved as a habitat for resident wildlife, it offers a retreat for those seeking peace and quiet or in search of fantastic birdwatching opportunities. Hides are dotted through the gardens enabling wildlife enthusiasts easy access to the abundant birdlife including pelicans that frequents the area - you may also see monkeys, squirrels and lizards who are free to roam. Boat excursions accompanied by a specialist bird guide are also available to book locally. The beautiful infinity pool is poised on the terrace edge, overlooking the lagoon towards the coast, and the perfect spot to cool off after a walk around the grounds; or why not wander to the beach, only 800m away? Adjacent terraces offer plenty of space to relax and enjoy the views with a refreshing drink in hand. 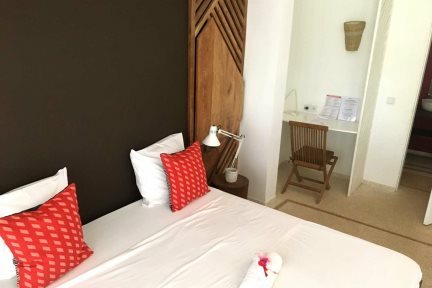 The rooms are housed in individual thatched lodges spaced around the gardens, providing a cool and comfortable place to relax, wtih all the facilities you would expect in a quality property, yet still with African touches. Some two-bedroom suites even offer their own plunge pool with fabulous views. The restaurant offers an extensive à la carte menu with a wide range of dishes, often using local ingredients and freshly caught fish. With a large covered terrace you can enjoy the laid-back atmosphere and the view at the same time. You're unlikely to dine outside the hotel as other eateries are not easily accessible, however our holidays are priced on bed & breakfast to leave you to choose from the delicious menu on offer. 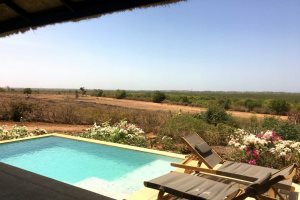 We would recommend this property for a few days as an add-on stay to a coastal hotel, or why not combine with Fathala Wildlife Reserve in the Sine Saloum Delta? Les Manguiers de Guéréo is located approximately 30 minutes from Blaise Diagne Airport. Spacious thatched lodge with a contemporary feel, set in the extensive gardens with a private terrace. Spacious thatched lodge with a contemporary feel, set in the extensive gardens with a private terrace. There are two separate bedrooms, ideal for a family or friends. Spacious thatched lodge with a contemporary feel, set in the extensive gardens with a private terrace complete with its own plunge pool and fantastic views. There are two separate bedrooms, ideal for a family or friends.